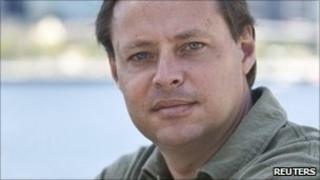 An Australian court has frozen proceeds from a memoir written by former Guantanamo Bay detainee David Hicks. The case is being brought by the Australian government under a law banning profits from crime. Hicks's legal team says the law does not apply because his conviction by a US military commission at Guantanamo Bay was invalid. Hicks spent five years at the facility before pleading guilty to providing material support for terrorism. His book Guantanamo, My Journey, tells the story of his incarceration at the controversial detention centre in Cuba. The Australian government wants to retrieve any profits that Hicks has made from the book, claiming he has benefited financially from a crime. The memoir has sold about 30,000 copies. It is not known how large an advance Mr Hicks received from the publisher, but estimates on royalty income so far hover at about A$100,000 ($107,000, £65,900). At Wednesday's hearing New South Wales Supreme Court Justice Peter Garling froze a trust fund containing proceeds from the book. A lawyer for the director of public prosecutions, who brought the case, requested an adjournment until 16 August so that the parties could continue "advanced" discussions on how the matter could be resolved. Hicks' legal team were expected to argue that his conviction should not be recognised by Australian courts, the BBC's Nick Bryant reports from Sydney. His father, Terry, has said that his 35-year-old son is being persecuted by the government. Australia's Green Party has called the prosecution a political show trial designed to deter authors from publishing politically sensitive material. Critics of the former detainee believe he has never adequately explained why he trained with Al-Qaeda in Afghanistan, where he was captured in 2001. Should Hicks profit from his book?